This article is about the modern army of Germany and post-World War II army of West Germany. For the World War II army of Germany, see German Army (Wehrmacht). For the World War I army of Germany, see German Army (German Empire). For the armed forces of the German Democratic Republic, see National People's Army. For other uses, see German Army (disambiguation). 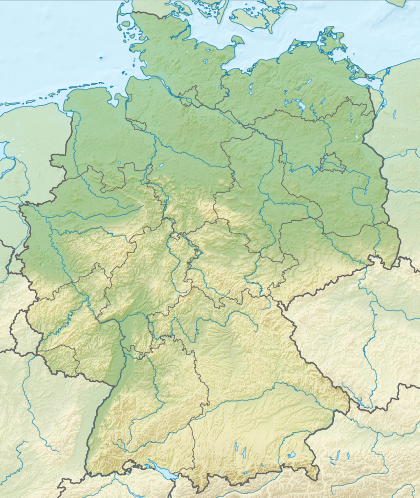 The German Army (German: Deutsches Heer) is the land component of the armed forces of Germany. The present-day German Army was founded in 1955 as part of the newly formed West German Bundeswehr together with the Marine (German Navy) and the Luftwaffe (German Air Force). As of 28 February 2019[update], the German Army had a strength of 62,194 soldiers. A German Army, equipped, organized and trained following a single doctrine, and permanently unified under one command dates from 1871, and the unification of Germany under the leadership of Prussia. From 1871 to 1919 the title Deutsches Heer (German Army) was the official name of the German land forces. Following the German defeat in World War I and the end of the German Empire the main army was dissolved. From 1921 to 1935 the name of the German land forces was Reichsheer (Army of the Realm) and from 1935 to 1945 the name Heer was used. The Heer was one of two ground forces of the Third Reich during World War II, but unlike the Heer, the Waffen-SS was not a branch of the Wehrmacht, but was a combat force under the Nazi Party's own Schutzstaffel forces. The Heer was formally disbanded in August 1946. After World War II Germany was split into two sovereign states and both formed their own militaries: on 12 November 1955 the first recruits began their service in the West German Heer, while on 1 March 1956 the East German Landstreitkräfte der NVA (Land Forces of the National People's Army) were founded. During the Cold War the West German Army was fully integrated into NATOs command structure, while the Landstreitkräfte were part of the Warsaw Pact. Following the German reunification in 1990 the Landstreitkräfte were partially integrated into the German Army. Since then the German Army has been employed in peacekeeping operations worldwide and since 2002 also in combat operations in Afghanistan as part of NATO's International Security Assistance Force. Bundeswehr soldiers with MG1 and HK G3 during a 1960s maneuver. In the background is a Schützenpanzer Kurz. Following World War II the Allies dissolved the Wehrmacht with all its branches on 20 August 1946. However already one year after the founding of the Federal Republic of Germany in May 1949 and because of its increasing links with the West under German chancellor Konrad Adenauer, the Consultative Assembly of Europe began to consider the formation of a European Defence Community with German participation on 11 August 1950. Former high-ranking German Wehrmacht officers outlined in the Himmeroder memorandum a plan for a "German contingent in an international force for the defense of Western Europe." For the German land forces the memorandum envisioned the formation of a 250,000 strong army. The officers saw the need for the formation of twelve Panzer divisions and six corps staffs with accompanying Corps troops, as only armored divisions could muster a fighting force to throw back the numerically far superior forces of the Warsaw Pact. On 26 October 1950 Theodor Blank was appointed "officer of the Federal Chancellor for the Strengthening of Allied Troops questions". This Defence Ministry forerunner was known somewhat euphemistically as the Blank Office (Amt Blank), but explicitly used to prepare for the rearmament of West Germany (Wiederbewaffnung). By March 1954 the Blank Office had finished plans for a new German army. Plans foresaw the formation of six infantry, four armoured, and two mechanised infantry divisions, as the German contribution to the defense of Western Europe in the framework of a European Defence Community. On 8 February 1952 the Bundestag approved a German contribution to the defense of Western Europe and on 26 February 1954 the Basic Law of the Republic was amended with the insertion of an article regarding the defence of the sovereignty of the federal government. Following a decision at the London Nine Power Conference of 28 September to 3 October 1954, Germany's entry into NATO effective from 9 May 1955 was accepted as a replacement for the failed European Defence Community plan. Afterwards the Blank Office was converted to the Defence Ministry and Theodor Blank became the first Defence Minister. The nucleus of army was the so-called V Branch of the Department of Defence. Subdivisions included were VA Leadership and Training, VB Organisation and VC Logistics. The army saw itself explicitly not as a successor to the defeated Wehrmacht, but as in the traditions of the Prussian military reformers of 1807 to 1814 and the members of the military resistance during National Socialism; such as the officers which undertook the failed 20 July plot to assassinate Adolf Hitler in 1944. Nevertheless, for lack of alternatives the officer corps was made up largely of former Wehrmacht officers. The first Chief of the Army was the former Wehrmacht General der Panzertruppe Hans Rottiger, who had been involved in the drafting of the Himmeroder memorandum. The official date of the founding of the army is 12 November 1955 when the first soldiers began their service in Andernach. In 1956 the first troops set up seven training companies in Andernach and began the formation of schools and training centers. On 1 April 1957, the first conscripts arrived for service in the army. The first military organisations created were instructional battalions, officer schools, and the Army Academy, the forerunner to the Führungsakademie der Bundeswehr in Hamburg. In total of twelve armoured and infantry divisions were to be established by 1959, as planned in Army Structure I. To achieve this goal existing units were split approximately every six months. However the creation of all twelve divisions did not take place until 1965. At the end of 1958 the strength of the army was about 100,000 men. The army was equipped at first with American material, such as the M-47 Patton main battle tank. Three corps commands were formed beginning in 1957: the I Corps, II Corps, and the III Corps. Also in 1957 the "Office for Territorial Defence" was established as the highest Territorial Army authority. The Office for Territorial Defence was under the direct command of the Federal Ministry of Defence and commanded the Territorial Army (Germany) (Territorialheer), a reserve formation. While the Heer along with the Marine and Luftwaffe were firmly integrated into the NATO Military Command Structure, the Territorialheer remained under national command. The main function of the Territorialheer was to maintain the operational freedom of NATO forces through providing rear area defence against saboteurs, enemy special forces, and the like. There were three Territorial Commands (Territorialkommandos), including North, South, and Schleswig-Holstein, and up to six Wehrbereichskommandos (WBKs), military regional commands. By 1985 each of the WBKs had two Heimatschutzbrigades (HSBs, home defence brigades). The development of Soviet tactical nuclear weapons required the development of a new Army structure even before Army Structure I was fully achieved. To minimize the effects of attacks with tactical nuclear weapons on massed forces, the 28,000 strong divisions of the Heer were broken up into smaller and more mobile brigades. These smaller units were also to be capable of self-sustainment on an atomic battlefield for several days, and to be capable of to move quickly from defense and to attack. The new armoured and mechanized brigades were capable of combined arms combat. Each division was composed of three brigades. The armoured brigades consisted of an armoured infantry battalion, two armoured battalions, an armoured artillery battalion and a supply battalion. The mechanized brigades consisted of a motorized infantry battalion, two mechanized infantry battalions, an armored battalion, a field artillery battalion and a supply battalion. The motorized brigades consisted of three motorized infantry battalions, an anti-tank battalion, a field artillery battalion and a supply battalion. The alpine brigades consisted of three alpine battalions, a mountain artillery battalion and a supply battalion. By 1959 the Heer consisted of 11 divisions of 27 brigades, four Panzer (armoured), four Panzergrenadier (mechanized), two Jäger (motorized), and one Gebirgsjäger (alpine). At the end of the Cold War the German Army fielded 12 divisions with 38 brigades: six Panzer (armoured), four Panzergrenadier (mechanized), one Fallschirmjäger (airborne), and one Gebirgsjäger (alpine) division. Nine divisions were grouped into three corps: I German Corps as part of NATO's Northern Army Group, II German Corps and III German Corps as part of Central Army Group. 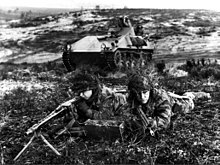 The remaining three divisions were part of Allied Forces Baltic Approaches (6th Panzergrenadier Division) and NORTHAG's I Netherlands Corps (3rd Panzer Division), while 1st Fallschirmjäger Division was assigned in peacetime to II German Corps and doubled as general staff for the ACE Mobile Force (Land). After 1990, the Heer absorbed the Nationale Volksarmee, the armed forces of East Germany. The former East German forces were initially controlled by the Bundeswehr Command East under the command of Lieutenant General Jörg Schönbohm and disbanded on 30 June 1991. In the aftermath of the merger, the German Army consisted of four Corps (including IV Corps at Potsdam in the former DDR) with a manpower of 360,000 men. It was continuously downsized from this point. In 1994 III Corps was reorganised as the German Army Forces Command. In 1996, the 25th Airborne Brigade was converted into a new command leading the Army's special forces, known as the Kommando Spezialkräfte. The 2001 onwards restructuring of the German Army saw it move to a seven division structure – 5 mechanized (each with two mechanized brigades), 1 special forces, and one air assault. 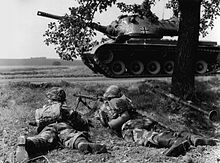 In 2003, three Corps still existed, each including various combat formations and a maintenance brigade, as well as the I. German/Dutch Corps, a joint German-Netherlands organization, used to control in peacetime the 1st Panzer and 7th Panzer Divisions as well as Dutch formations. The 1st Panzer would have reported to the corps in wartime while the 7th would be posted to the Allied Rapid Reaction Corps. II Corps was German in peacetime but would have exchanged a division with the V U.S. Corps in time of war (the 5th Panzer). The 5th Panzer was formally Division disbanded as of 30 June 2001. In peacetime it also commanded the 10th Panzer Division, which was allocated to Eurocorps and which parents the German half of the Franco-German Brigade. The 1st Mountain Division at Munich was also subordinate to this headquarters. The IV Corps was headquartered at Potsdam in eastern Germany and controlled two Panzer-Grenadier Divisions, the 13th and 14th. The 14th Panzergrenadier Division also took control of units in Western Germany re-subordinated from the 6th Panzergrenadier Division when it lost its command function. It would have made up the German contribution to the Multinational Corps Northeast in time of war. IV Corps also used to have under its command the Military District Command I, the 1st Airmobile Brigade, and the Berlin Command (de:Standortkommando Berlin). All corps have now been disbanded or transferred to a multinational level such as Multinational Corps North East. IV Corps was reorganized and on 31 March 2002 became an overseas deployment command, the Einsatzführungskommando der Bundeswehr, like the British Permanent Joint Headquarters. An army reorganisation in recent years has seen the disbandment of the 13th Mechanized Infantry Division headquarters, a merge of the Airmobile Operations Division and Special Operations Division headquarters, the disbandment of the 1st Airmobile Brigade, and reshuffling of units between divisions. No heavy brigades were disbanded, but the two remaining heavy divisions command three rather than two brigades. As of 28 February 2019[update] there were a total of 62,194 soldiers on active service in the German Army. However, the quite unique German military branch of the Joint Support Service consists to a significant degree of Heeresuniformträger (army uniform wearing personnel). This is also contributed to by the Joint Medical Service, which does have other solely-military-medical branch counterparts (such as in South Africa). In accordance with EU working hour regulations, the regular work-week is 41 hours, although numerous exceptions exist for e.g. deployments in oversea missions, training exercises, emergencies, and similar military needs. A German Army soldier demonstrates the equipment of the IdZ program. The German Army is commanded by the Inspector of the Army (Inspekteur des Heeres) based at the Army Command (Kommando Heer) in Strausberg near Berlin. The training centers are supervised by the Army Training Command in Leipzig. The combat units of the army include two armoured divisions, one rapid forces division and the Franco-German Brigade, which is under direct supervision of the Army Command. Unlike other European armies such as neighbouring France, regiments are not a common form of organization and are thus rare in the German army. Battalions are directly subordinate to brigades or to divisions as divisional troops. German infantry battalions field 1,000 men, considerably larger than most NATO armies, i.e. twice the size of a US Army battalion. The German Army has eleven different branches of troops, designated as Truppengattungen. Each Truppengattung is responsible for training and readiness of its units and disposes of its own schools and centres of excellence for doing so. Optically this distinction can be made by the branch colour, called Waffenfarbe which is displayed by a cord attached to the rank insignia, and the colour of their beret with a specific badge attached to it. The rank structure of the German army is adjusted to the rank structure of NATO. Unlike its predecessors, the modern German Army does not use the rank of Colonel General. The highest rank for an army officer is Lieutenant General, as the rank of Full General is reserved for the Armed Forces chief of staff or officers serving as NATO officers. ^ "World Air Forces 2017". Flightglobal: 10. Archived from the original on 31 July 2017. Retrieved 10 February 2017. ^ a b "Die Stärke der Streitkräfte [Personnel strength of German Armed Forces]". 22 March 2019. Archived from the original on 22 August 2016. Retrieved 25 March 2019. ^ Isby and Kamps 1985, 228-229. ^ "FAQ Arbeitszeitregelung". Bundeswehr. 30 December 2015. Archived from the original on 14 May 2016. Retrieved 3 May 2016. Addington, Larry H. The Blitzkrieg Era and the German General Staff, 1865-1941 (1971). Bartov, Omer. Hitler's army: Soldiers, Nazis, and war in the Third Reich (1992). Bull, Stephen. German Assault Troops of the First World War: Stosstrupptaktik-The First Stormtroopers (History Press, 2014). Citino, Robert M. The Path to Blitzkrieg: Doctrine and Training in the German Army, 1920-39 (2007). Citino, Robert M. Quest for Decisive Victory: From Stalemate to Blitzkrieg in Europe, 1899-1940 (2002). Dupuy, Trevor Nevitt. A Genius for War: The German Army and General Staff, 1807-1945 (1977). Gross, Gerhard P. The Myth and Reality of German Warfare: Operational Thinking From Moltke the Elder to Heusinger (2016). Deist, Wilhelm, ed. The German military in the age of total war (Berg, 1985). Hughes, Daniel J. and Richard L. DiNardo, eds. Imperial Germany and War, 1871-1918 (University Press of Kansas, 2018). Kelleher, Catherine M. "Fundamentals of German Security: The Creation of the Bundeswehr: Continuity and Change", in Stephen F. Szabo (ed. ), The Bundeswehr and Western Security, St. Martin's Press, New York, 1990. Seaton, Albert. The German Army: 1933-45 (1982). Wikimedia Commons has media related to Heer (Bundeswehr). Axis History - Axis History site including German troops.